Is this web site only for Canadian users? What will the telegram look like? Is it really safe to use my credit card online? How do I check Telegrams Canada's Better Business Bureau record? How do I order a telegram by e-mail or phone? What time are telegrams delivered? What if no one is home to receive the telegram? Can you deliver to an inn (hotel, motel, resort or B&B)? Is there any way my telegram can be delivered same-day? Is there any way my telegram can be delivered on the weekend? Can you guarantee delivery times? Can I require a signature? The recipient told me they never got the telegram. What happened? How can I get confirmation of delivery? How can I get a copy of a telegram? I'm looking for a singing or dancing telegram delivery. Do you do those? How can I contact Telegrams Canada? 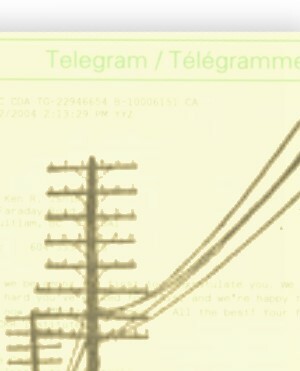 Is Telegrams Canada still part of the railway telegraph system? The Telegrams Canada web site is only available to Canadian credit card holders with a Canadian billing address. International users may obtain telegram service at International Telegram. 1. We encrypt your credit card details using the high-security data encryption standard used by financial institutions and the Government of Canada. 2. We are registered merchant account holders with Mastercard, Visa and Amex Canada. That means your payment goes directly through the banking system only; your credit card details are never handed off to a third-party payment service like Paypal or other foreign companies. 3. We have earned accreditation by the Better Business Bureau. That means full transparency: you can check our complaint record online. We're proud that we receive nearly zero complaints even though we serve thousands of customers each year. If there's a problem with your order, we'll make it right! You can check our record online or by calling the BBB at 1-800-459-8875. Telegrams can be ordered securely through our web site. Ordering by phone and e-mail is no longer available. Delivery information for telegrams to Canadian addresses can be found here. For specific delivery information please see the delivery details for each country here . Telegrams to remote places may take longer than the standard delivery time. Telegrams to private homes and most businesses within Canada are usually delivered between 8:00 a.m. and 5:00 p.m. Monday through Friday. Telegrams to hotels can also be delivered at night or on weekends. If no one is home when the courier arrives, the telegram will be left at the door. Sometimes the telegram cannot be left at the door, for example, in a lock-out apartment building. In that case, a door hanger will be left on the door. The door hanger tells the householder where to pick up the telegram locally, or how to arrange re-delivery. Telegrams are kept at the local delivery office for one week. If after one week no one picks up the telegram, it will be destroyed. Unclaimed telegrams are not refundable. For lock-out apartments, if no one is home and the householder cannot be reached by phone, the telegram will be mailed. Mail delivery may take several days. Yes! In most cases, we can electronically deliver the message to the front desk the same day. The telegram will then be printed and hand delivered by the establishment's staff. If the guest has not yet checked in, the telegram will be kept at the front desk and handed to the guest upon check-in. Same-day delivery is available only to certain cities. See the delivery details for more information. Telegrams to inns can be delivered Saturday or Sunday. There is no additional charge for weekend delivery. Delivery to homes and other businesses is Monday through Friday excluding holidays. We are committed to getting your telegram there on time. Even so, delays can occur due to bad weather, road conditions, communications bottlenecks and other factors. For this reason, we can't guarantee delivery times. If you have questions about delivery to a specific location, please contact us before sending your telegram and we'll give you the most current delivery information. You can require a signature for telegrams to business addresses in Canada and the United States. There is an extra charge for this service (see details on the order page). Was the address correct? Telegrams are hand-delivered, so you should carefully check the address for accuracy. A misspelled street name, missing phone number, incorrect postal code, or incomplete address can cause the telegram to be delayed or returned. Is the telegram still in transit? Telegrams to some places may take more than one business day for delivery. To areas with no service at weekends, if you placed your telegram on Friday it might not be delivered until Tuesday. Did the recipient respond to the door hanger? If a notice was left at the door, did the recipient arrange for re-delivery or pick up the telegram locally? If not, the unclaimed telegram will be destroyed by the local delivery office after one week. For First-Class telegrams delivered within Canada and the US, we can provide confirmation of delivery for a fee of $19.00 which includes a certified copy of your telegram. For telegrams sent overseas, please note that some countries do not offer confirmation of delivery. If we are able to confirm overseas delivery, there is a charge of $19.00 for this service. Please contact us for more information. Delivery confirmation is not available for Mailgram service. Telegrams Canada retains copies of all telegrams for at least six months. Regular Copies: A duplicate copy of a telegram can be mailed to the sender or recipient for an $12.00 charge (includes cost of mailing). 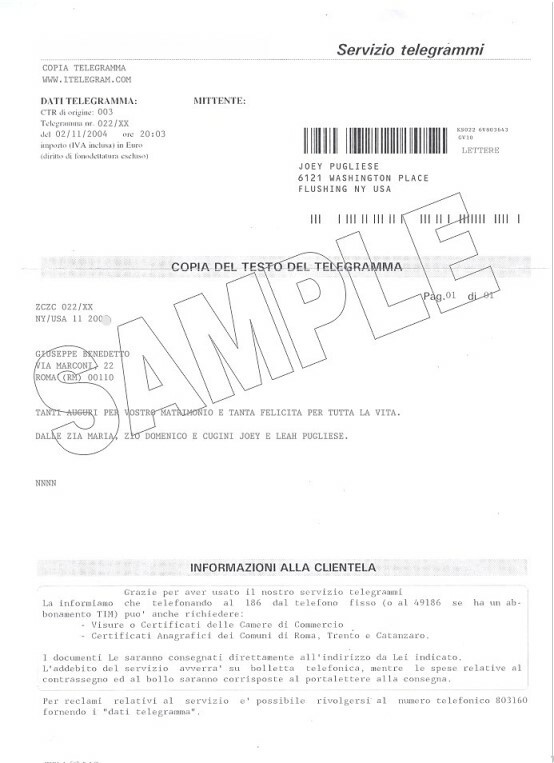 Certified Copies: If you require a certified copy of a telegram, the fee is $19.00 (includes cost of mailing). Over Six Months: If your telegram was sent more than six months ago, we may be able to provide a copy. There is a research fee of $20.00 plus the price of the copy as above. To request a copy, please contact us. We do not offer singing or entertainment telegrams. For these services, please check your Yellow Pages directory under "Telegrams, Singing, Dancing, etc." or visit YP.CA. There's over 150 years of history behind telegram service in Canada! In the past, the public telegram service and telex exchange were operated by Canadian National Telegraphs and Canadian Pacific Telegraphs (CNCP Telecommunications, later called Unitel). 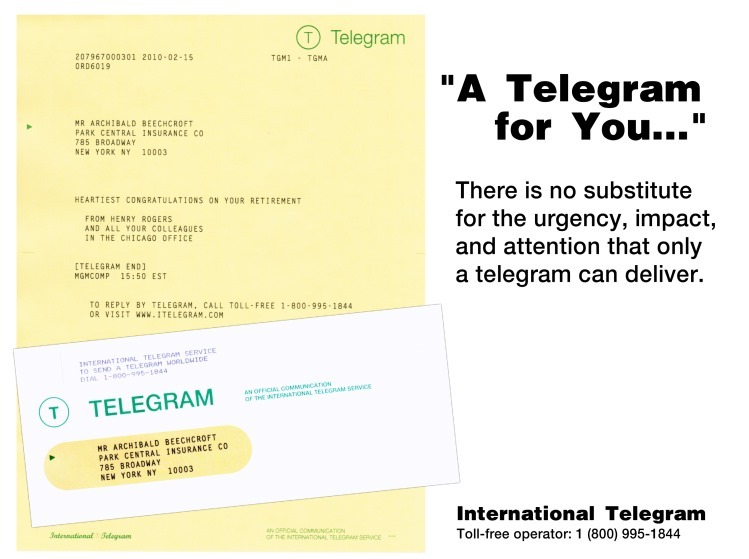 Since 2002, Telegrams Canada is the only CRTC license holder for telegram service in Canada. Our main telecommunications centre, at 151 Front Street West in Toronto, was built in 1954 by Canadian National Telegraphs. We're proud to still operate in that same facility where telegrams have been switched for over half a century! Our technology has modernized a lot over the years, from Morse code to teletype, and punched paper tape to racks of high-speed fibre optic network servers. Most of the telecommunications rights-of-way along Canada's railroads have been transferred to Allstream, who also handle enquiries regarding railway telco pension matters. Telegram service is no longer part of the railway system, but we're proud of those railway telegraphers who built the service that is still a much-used part of our heritage. 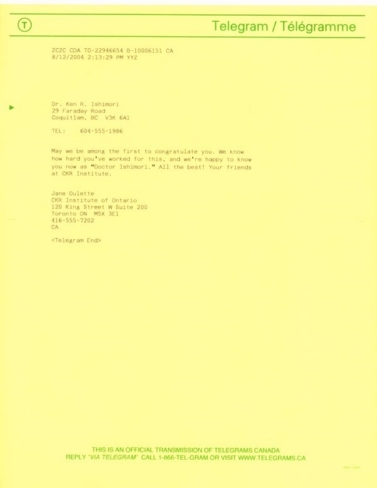 © Telegrams Canada and associated companies. All rights reserved. This site is exclusively for residents of Canada. International customers click here.